How would you like to live in a place where you are never more than a stone’s throw from the warm waters of the Gulf of Mexico? Marco Island is the destination of choice for over 20,000 vacationers every year and permanent dream home for around 16,500 year-round residents. Marco Island is alive with the sounds of live music, the cries of sea birds, and friendly neighbors with the ever-present sound of the Gulf washing up on the shore in the background. At night, especially, the sound of the shore becomes a gentle lullaby. 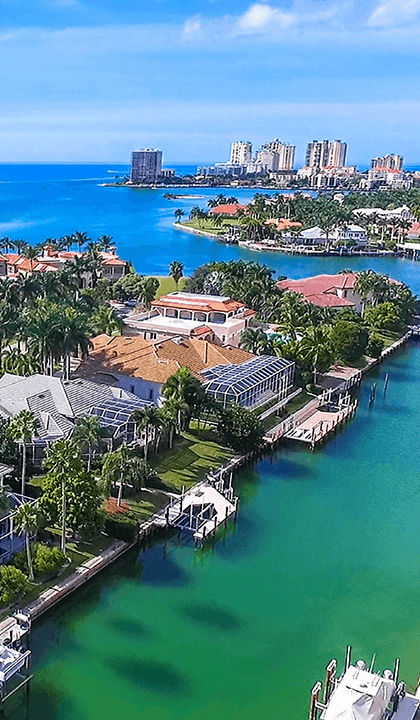 Marco Island has a rich history and is both the largest and only truly developed of the Ten Thousand Islands trailing off the coast of Southwest Florida. The island and surrounding area is also the site of an anthropological expedition by Frank Hamilton Cushing. The most notable finding from that and subsequent expeditions is the Key Marco Cat which is currently on display at the Smithsonian Institution in Washington, D.C. It shows the sophisticated and social culture that developed here and we have evidence showing this area was inhabited thousands of years ago. Marco Island was initially incorporated in 1927 as Collier City (after Barron G. Collier, the investor that is directly or indirectly responsible for the development of Southwest Florida) but abolished itself in 1957 for a period of time extending until it was reincorporated in 1997 as Marco Island. Dozens upon dozens of restaurants and businesses call this city home. You can dine at a different restaurant for each meal every day for two full weeks and still not discover every hidden gem the island hides. The relaxed atmosphere of this island paradise blends naturally with the abundance of leisure attractions, restaurants, and bars in Marco Island. Many of the establishments on the island are highly-rated on sites such as TripAdvisor and regularly receive glowing reviews, even in the slower summer months. From fresh catches to sloppy joes, from garden salads to pizzas, you can find just about anything you could ask for on Marco Island. For those with special dietary restrictions, there are plenty of vegan, vegetarian, and gluten-free options to choose from so you won’t be restricted to just one or two restaurants able to accommodate you. Marco Island has many adventures that are fun for both visitors, part-time vacationers, and both old and new locals. Take an eco-tour of the Ten Thousand Islands with its lush flora, lively fauna, and stunning natural beauty. Of course, what would an island town be without fishing? There are numerous local boating services that will allow you to drive out in to the Gulf to do true deep-water fishing like you’ve never seen. Closer to the shore, there are snorkeling opportunities to enjoy and some beach houses and hotels offer rental snorkeling equipment for perfect convenience. “Convenient” is a great word to describe how Marco Island’s ease of access to amenities and local attractions. Speaking of ease-of-access, the drive to US-41 Tamiami Trail or I-75 is a relatively short one and that allows stopping in Miami or Naples to be a day trip! All in all, Marco Island is a wonderful place to escape from your regular life. Don’t wait – start looking for your new dream home now!